AUSTRALIA IS THE land of the comeback. Ian Thorpe's training for a berth in the next Olympic Games. Darryl Somers enjoyed a TV revival with his show about ballroom dancing. Pat Cash even had one last crack at the Australian Open in the late '90s. 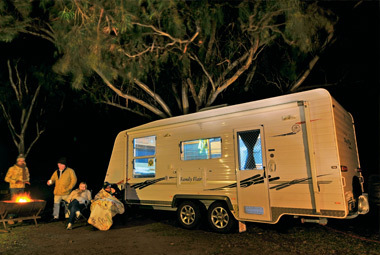 Family caravanning is no different. Around the same time that Pat was gearing up for a final shot at Open glory, a request to see a manufacturer's brochure on a bunk van would've been met with a glazy stare. These days, however, almost all of the major builders have them on their books. But such is the variety on offer that finding the right one can be difficult, to say the least. 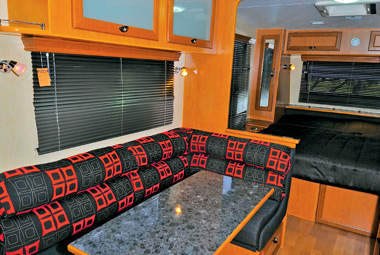 This is where our Royal Flair Family Flair Legends Series test van comes in. The Family Flair range is comprised of six layouts - we went for layout FF02. There is an elegance and simplicity to this design that suggests finding the right van for your family doesn't have to be difficult at all. 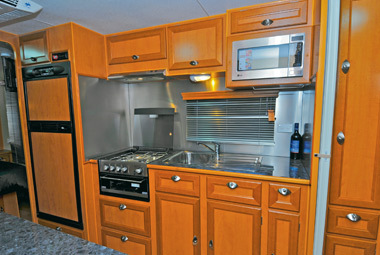 Our Family Flair has its main bed up front, a nearside dinette amidships and kitchen opposite. However, where a full-width rear bathroom might be in a van designed for touring couples are three bunks, each bound to be a winner with the kids. Each bunk's foam mattress measures 1.8x0.68m (5ft 11in x 2ft 2in). The bunks also have their own good, deep locker on the offside (i.e., the foot of the bed) with a halogen reading light on the offside (the head of the bed). A tip: be sure to teach the kids to turn off their own reading light, as space is a bit tight for an adult to do the job easily. Out of curiosity, I spent a night in the bottom bunk and had a good night's sleep - surprising, since they're designed for kids and not a 1.87m (6ft 1in) adult. 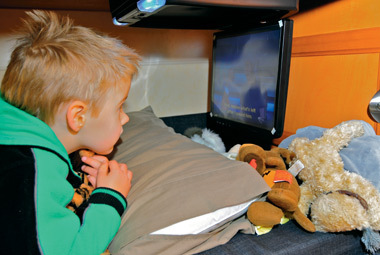 Each bunk is fitted with its own drop-down DVD player - fantastic. Ben, Sophia and Ethan, the kids who came along for this comparison of family caravans, were entertained for hours. It's important that a family van addresses the issue of entertainment for children, and on this measure the Family Flair does very well. 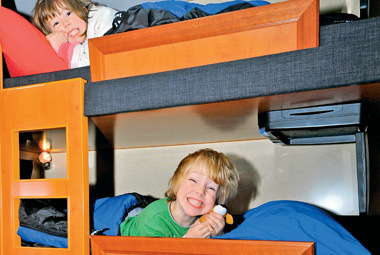 The fold-up guardrail for the middle bunk is somewhat impractical, though. Each bunk is fitted with the same rail, secured to the base of the bunk by hinges, allowing it to be folded flat against the base, under the mattress. This system will work if the kids are too young to climb down the ladder themselves; however, if the kid sleeping in the middle bunk is older and more mobile, they will have to climb over that guardrail and slightly contort themselves to reach the ladder. Again, the arrangement is only awkward for the middle bunk. This Family Flair has storage - so important in a family van - in spades, though it could be improved here and there. 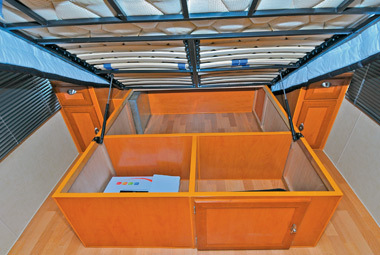 The cavity beneath the lower bunk is all storage space, with floor-level hatch access. This is a terrific area for flat items, such as folded-up camp tables, etc., but that hatch won't be adequate for accessing larger items or things pushed to the back - you'll have to lift the mattress out of the way to do that. External access via a slimline door either side of the van might be a solution. The wardrobe next to the entrance is 490mm deep and about 920mm high and also includes a drawer and a few shelves - an identical wardrobe is opposite, between the bunks and the kitchen. 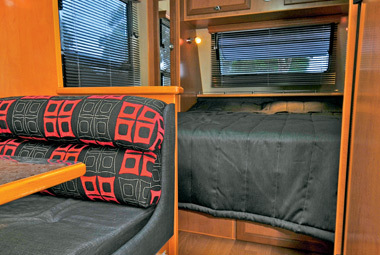 A concertina curtain separates the wardrobes and bunks from the rest of the van. The nearside L-shaped dinette is good for two adults and one child - but if your kids are quite young, another could squeeze in. Sensibly, Royal Flair has fitted a drawer to the storage compartment beneath the base of the "L" - rummaging on your hands and knees, or lifting lounge cushions to find what you need in space as limited as a caravan, can be frustrating. The lockers above the dinette look classy and at first glance appear very generous in size, which, at 490mm high, they are. But because the space isn't divvied up by shelves and a partition, we'd estimate that only the first 200mm is genuinely useable. The kitchen has the travelling chef covered. No, an oven isn't standard, but I prefer to have the storage space beneath the griller that you'd otherwise lose if an oven was fitted. Speaking of storage, there's a two-tier pantry that'll hold a couple day's worth of foodstuffs, and a good spread of cupboards. The drawers, unfortunately, weren't fitted with stoppers (except for the pot drawer under the stainless steel Spinflo Minigrill MkIII cooktop). The LG microwave is positioned at a user-friendly height above the bench, set into the timberwork that also contains some overhead lockers. The three-way Thetford fridge/freezer is a generous 184L - the right size for a family. The locker above the fridge hides the switch for the 12V water pump, the water level indicator, and the 240V circuit breakers. A JVC sound system is fitted neatly into the cabinetry above the fridge. The plumbing (gas line, grey water pipe) under the sink and stove is well sealed where it runs through the floor. As most Vic readers would appreciate, the east Gippsland region where we conducted the latest Legends event gets rather chilly in winter. The upside, however, was that the weather was perfect for trying out the reverse-cycle function of the air-conditioner in each van. And the Aircommand Cormorant unit fitted to the Family Flair warmed things nicely. 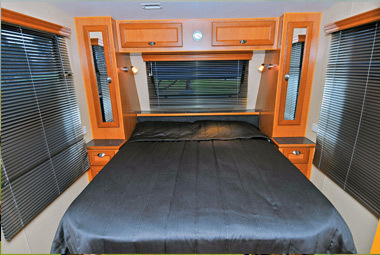 The bedroom has everything that a caravan's bedroom should: queen-size bed with innerspring mattress measuring 1.53x1.9m (5ft x 6ft 3in), wardrobes either side with about 1.12m of hanging space, overhead lockers, and a flatscreen TV mounted to a swivel-arm bracket so that it can be viewed from the bed or dinette. The TV has an integrated DVD player - nice. The full-height storage unit at the foot of the bed on the nearside is sensibly divided into three separate cupboards, while the half-height unit on the offside houses the TV cables, 12V fusebox, the Breakaway unit, and the water tank filler hose (which, like the plumbing under the sink and stove, is properly sealed where it runs through the floor). Overall, it's hard to fault the bedroom: the only niggle is the lack of a stopper on each bedside table drawer. 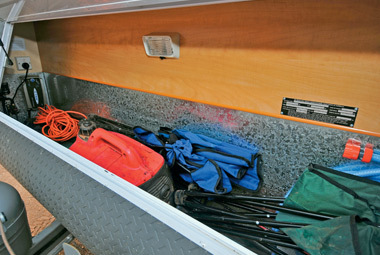 The under-bed storage is divided into three separate compartments, with an access door to the portable toilet compartment. 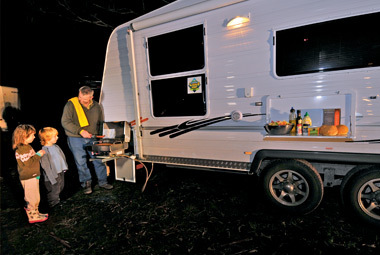 Generally, the Family Flair is a well-lit van, with halogen spot/reading lights in all the right places, a couple of fluorescents for the main cabin lights, and a hatch above the bed and in the kitchen, each with a block-out screen. Externally, the aluminium-clad Family Flair is arguably the best on test. With its stainless steel Swift slide-out barbecue, DNA speaker for piping out music from the internal stereo, and the fold-down picnic table, there is a good spread of features to keep the family smiling. The twin 9kg cylinders on the drawbar will provide an ample supply of gas. Considering this Family Flair doesn't have a bathroom - the only one on test not to have one - and therefore won't burn lots of gas heating shower water, I suspect an on-board gas capacity of 18kg is overkill. Two 4.5kg cylinders might work better. The front boot is spacious enough for general camping gear, despite the fact that the 100Ah battery and CTEK charger is kept there. Underneath, everything is nice and clean, with the gal-protected 90L water tank mounted forward of the axles and load-sharing leaf-spring suspension. You've got to like the 15in alloy rims, too. It's not the most sophisticated or feature-packed family caravan on the market, so what makes this Family Flair so appealing? The answer: the combination of a strong build; quality finish; and the fact that it doesn't pretend to be something that it's not. Okay, so it doesn't have a bathroom, but that's not a deal breaker; after all, each of the four vans on test in Gippsland would be frequent visitors to caravan parks most of which, nowadays, have all the facilities you're likely to need. In fact, the slightly increased bench space, the uncramped forward bedroom, and the east-west bunks make not having a bathroom a worthwhile trade-off. Without the use of towing aids, the Family Flair was fine on smooth bitumen and when cross winds were minimal. In less-than-ideal conditions, however, it pitched and yawed just a little. We're confident a weight distribution hitch would've tightened the combination. With plenty of storage, an uncluttered layout, and berths for three kids each with their own DVD player and screen, this Family Flair deserves more than a second look. 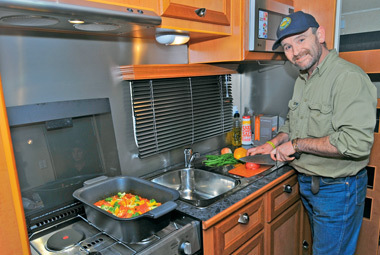 Source: Caravan World Aug 2011.